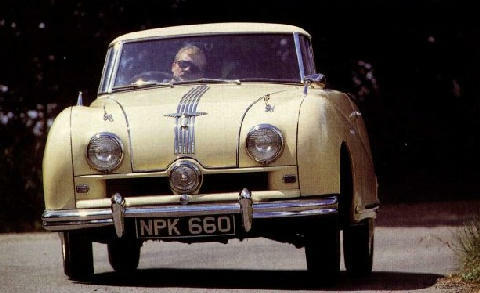 Launched in 1948 the A90 Atlantic was a misguided attempt by Austin to offer a car designed to appeal to American tastes, America being a highly important export market. Unfortunately for Austin the car was never accepted and found few takers on the other side of the Atlantic, America wanted British cars to look British, not American! 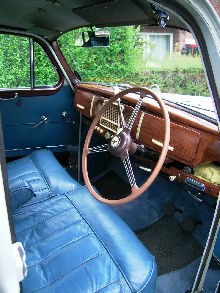 The Atlantic was initially only available as a Convertible complete with an optional power operated hood mechanism, from 1949 it was also available as a Hardtop Saloon, an unusual feature being a wind down rear window. 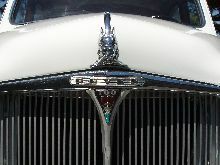 Both cars had strange American influenced styling cues including five chrome strips running down the bonnet, a built in centre spot lamp, a "flying A" mascot on each front wing and rear wheel spats. 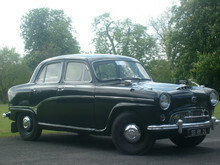 Production ended in 1952 after just under 8,000 Atlantic's had been sold, despite many attempts by the Austin marketing department including record attempts and European Rally entries. 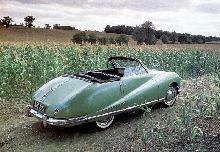 The A90 was not directly replaced but its 2660cc, 4 cylinder engine lived on in the Austin Healey 100. It was common knowledge that the Atlantic held many endurance World Records up to 7 days These were all set stateside and that a works collegue:- development engineer "Charles Goodacre" a prewar Austin Works racing Driver was involved . Some were said to have never been challenged.